Seriously, it’s fun! When I go to Bandung, I always take public transportation such as bus and train. And also angkot (angkutan kota), a car which is modified to pick about 12 passengers up. There are so many angkots in this city. Bandung must be has other nickname after Flower City and Parijs van Java: The Angkot City! Maybe there are about 5.000 angkots in Bandung. They cruise around in about 82 routes. It’s a lot! I have visited Surabaya and found that its angkot population is not as many as Bandung’s. I don’t know why, whereas Surabaya is a metropolitan whose people definitely are more numerous than Bandung. Do I have to proud with this fact or otherwise? Because in fact, those angkots do frequently cause the traffic jam. You can imagine, angkots may stop everywhere and don’t even care if there is a forbidden sign beside it. The driver would stop whenever a passenger wants to get out or get in. Well, that passenger is to blame also, I think. The angkots could possibly stop not exactly beside the sidewalk. When the passenger says “Kiri!” (means “to the left”), the driver often pull over the car in the middle of the street. In sudden! And get ready to hear the symphony of horn from behind you. 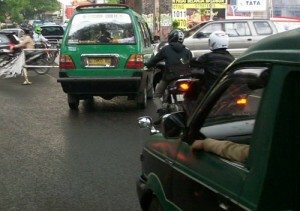 Sometimes, the angkots also make new “terminal” at the street or crossroad. Sometimes, they are ngetem or stopping for a long time to wait until the car is full of passengers. If you are in a hurry or don’t want to waste more time, just take another angkot (which isn’t ngetem). Those are some unpleasant things from angkot. However, I still enjoy use angkot to go everywhere in Bandung. I never drive my own car. You know, I dream and fall asleep easily when get bored. So, public transportation, especially angkot, is my option. On it, I can fall asleep anytime. But of course, first I have to tell the driver my destination. * almost never be passed by. ** be passed by at 20.00-05.00. Want to go to some place in Bandung by angkot? Then press Ctrl + F and type your destination. In case you need a map, click here. Just remember, sometimes, those routes change. For example, I used to take angkot St. Hall – Dago from Bandung’s Railway Station to Jl. Merdeka (Merdeka Street). The route I knew was from Wastukencana Street, and the angkot turns right to Aceh Street. One day, I want to go to Merdeka Street and took the same angkot, from Wastukencana Street the angkot did not turn right, but still take Wastukencana Street. It turned right to R. E. Martadinata (Riau) Street! So, just mention your destination to the driver and he will tell you when you arrive there. Jd inget waktu mau ke Stasiun Bandung tp nyasar ke Kiara Condong. Hahaha, setan tuh supir. Yeah, sometimes I walk too. But when I’m tired, I prefer take angkot. Hehehe. I had lived in Bandung for eight years yet I know very little about the directions. Where did you get such a complete reference hehehe.